Food is one of those things we all have strong opinions about: what we like, what we don’t like. So we get that when you’re planning an event, choosing the menu can be a daunting task! Which is why we want to share our perspective on the basics of choosing a menu. Consider this your crash course in menu planning! Step 1: Consider your guests. This is where you start, always. What information do you have about the attendees? How old are they? Do you know any lifestyle information? 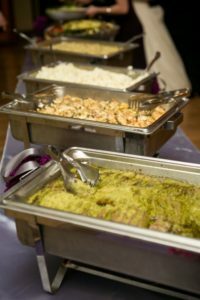 Are there many professionals who frequently attend catered banquets? It might seem like overkill, but if you know a large portion of your guests are fitness buffs, that will help you make a decision between serving a salad or the macaroni and cheese. Step 2: Vary the options. Here’s a fact: at least one of your guests will have dietary preferences and allergy needs. In fact, it’s likely multiple guests will have special dietary requests. And while you can’t make everyone happy, it is possible to construct a well-rounded menu that offers at least something everyone can enjoy. As much as your budget allows, provide your guests with a range of options. Step 3: Decide how you will serve. If you’re catering a full meal, you’re faced with the choice of plate service or or buffet style. The price points are different, but the style of each option suits different events better and even influences how much food you need (often, people eat much more at a buffet than they do plate service!). Time-wise, you will need to plan at least 1.5 hours (if not 2) for a plated meal. Depending on how many guests you have, a buffet can be served in an hour. Step 4: Contact your caterer. The best part about the basics of choosing a menu is you have an expert at your side. You want to work with a caterer who is knowledgeable and experienced in the kind of event you’re planning. They will be able to help answer any of your questions and help you make the decisions involved in planning your event’s menu. At Chef du Jour Catering, we have over 10 years of experience catering all manner of events and gatherings in the Portland area. We enjoy working with our clients and serving them to the best of our ability. If you need a Portland caterer, we would enjoy the opportunity to find out how we can meet your needs.